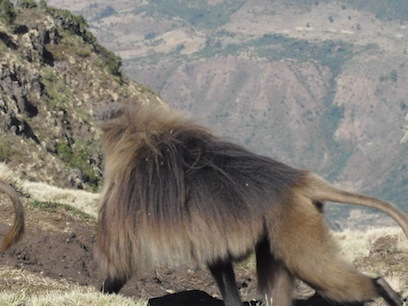 In the Simien Mountains, the Gelada Baboons roam amidst gorgeous scenery. It was like looking out over a section of the Grand Canyon. Closer up, the thick-billed ravens perched amongst abysinth roses; much like a white beach rose but growing on a tree of thorns. On a guided day trek from Debark, Ziggy lent me his walking stick and explained there was tension about whether to relocate people out of the Simien Mountains National Park. I wondered if that had anything to do with our being accompanied by guides bearing rifles. 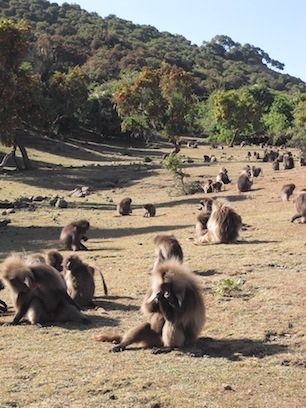 Ziggy estimated the Gelada Baboon population in the National Park to be about 15,000. There did seem to be lots of those fluffy apes and they studiously ignored us hiking humans. But then, they had us so outnumbered. And these Gelada Baboons paid much attention to each other, interacting in all sorts of ways. Ziggy said some biologists had determined, through looking at their DNA, that these were not actually baboons but apes of a wholly separate primate group. The National Park was established in 1963 and covers 90 square miles, an impressive effort toward land conservation and animal preservation. TATTOO—Journeys on My Mind is available at Amazon.com and BarnesandNoble.com and Apple’s iBookstore. Get an ebook or paper book now. Click here for more on Ethiopia.